Pseudonaja guttata (speckled brown snake). Pseudonaja textilis (eastern brown snake). Pseudonaja nuchalis (western brown snake). Pseudonaja modesta (ringed brown snake). Envenomation by P textilis, P nuchalis, P guttata, and P affinis has been documented, but little information is available about the toxic effects of the other species. All of these snakes occur mainly in inland floodplains with deeply fissured soils. The snakes are active during cooler parts of the day, such as early morning and late afternoon. They exist in 5 different colors, have a highly flexible head, and can squeeze into narrow places. They feed on small animals but also can grip large prey. They may bite humans above the knee by raising their head from the ground and assuming an "S" shape when striking. Unless provoked, they are thought to be reluctant to attack humans. Most of the literature describing the brown snake consists of case studies of people accidentally bitten and their clinical course. They have less effective dentition than other elapids and may leave little evidence of a puncture wound; however, their venom is readily diffusible and can rapidly enter the circulation. These snakes are among the most venomous in the world. The common brown snake produces the second most toxic snakebite venom known (LD 50 0.53 mg/kg) and is the most common cause of snakebite death in Australia. Common to these species' venom are neurotoxins and hemotoxins. Cardiovascular depression may be caused by intravascular coagulation, or the venom may contain a primary myocardial depressant. The potent neurotoxins cause neurological symptoms soon after envenomation. One example is texilotoxin, a multimumeric polypeptide from the common brown snake. These neurotoxins can cause respiratory paralysis by blocking nicotinic acetylcholine receptors at the postsynaptic motor endplate and/or affect neurotransmitter release at presynaptic motor nerve endings. Convulsions may occur. Little or no myotoxicity is present. Pseudonaja species live mainly in Australia. About 3000 bites occur per year in Australia from all species of snakes, 500 of which require antivenin. The dugite brown snake may be found in the southwestern corner of Australia, in Western Australia and along the South Australian border. 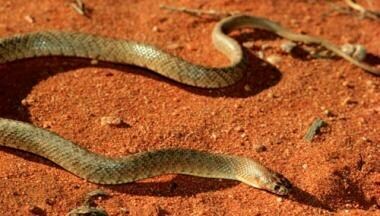 The speckled brown snake can be found from central Queensland to the eastern areas of the Northern Territory. Ingram's snake may be found around Barkly Tableland of the Northern Territory, and the ringed snake may be found in the arid regions of all the mainland states. The western snake may be found throughout Australia and the common brown snake in Queensland, New South Wales, and from Victoria to the southeast of South Australia. Snakebites tend to occur more often in the warmer months reflecting increased snake activity as well as increased human outdoor activity. The predominance of the bites occur in the lower limb. Males are bitten more frequently than females, presumably because of the greater popularity among males of owning and handling snakes as well as greater risk of occupational and recreational exposure. Young children tend to become critically ill sooner than adults because of their smaller body weight and tendency to receive multiple bites. If no systemic symptoms are present, recovery is expected. Since the development of antivenin and the use of compression bandages, fatalities from brown snake bites have become rare. However, in spite of prompt medical care and antivenin administration, the potency of the venom has produced fatalities. Of all the cases of snakebites in Australia, only 2-3 fatalities occur per year. As many as 60% of fatalities from snake envenomations may be attributed to the brown snake. Early deaths (within hours) are thought to result from the venom's cardiotoxic effect as well as anaphylaxis to the venom. Delayed deaths appear to result from secondary complications, such as intracranial hemorrhage, from the venom's hemotoxins. Approximately 30% of brown snake bites cause systemic envenomation; 60% of bites with systemic involvement produce altered mental status, loss of consciousness, or seizures; and approximately 33% of these present with defibrination syndrome. The subcutaneous median lethal dose (LD50) for the common brown snake in 18- to 21-gram mice is 0.053 mg/kg. The average yield of a venom milking is 4 mg, and the highest recorded yield is 67 mg. The LD50 for other species of brown snake for 18- to 21-gram mice are as follows: 0.47 mg/kg for P nuchalis, 0.66 mg/kg for P affinis, and 0.36 mg/kg for P guttata. The public should be aware of the danger of being bitten by a brown snake so vigilance may be exercised when traveling or when owning such a snake. Because of the potency of the snake venom, the public should not delay seeking medical care. For patient education resources, visit the First Aid and Injuries Center. Also, see the patient education article Snakebite. Clinical Toxinology Resources. Pseudonaja textilis. Available at http://www.toxinology.com/fusebox.cfm?fuseaction=main.snakes.display&id=SN0533. Accessed: May 12, 2016. Singh RR, Uraiya D, Kumar A, Tripathi N. Early demographic and clinical predictors of developing acute kidney injury in snake bite patients: A retrospective controlled study from an Indian tertiary care hospital in North Eastern Uttar Pradesh India. Indian J Crit Care Med. 2016 Jul. 20 (7):404-8. [Medline]. Ou J, Haiart S, Galluccio S, White J, Weinstein SA. An instructive case of presumed brown snake (Pseudonaja spp.) envenoming. Clin Toxicol (Phila). 2015. 53 (8):834-9. [Medline]. Isbister GK, Scorgie FE, O'Leary MA, Seldon M, Brown SG, Lincz LF. Factor deficiencies in venom-induced consumption coagulopathy resulting from Australian elapid envenomation: Australian Snakebite Project (ASP-10). J Thromb Haemost. 2010 Nov. 8(11):2504-13. [Medline]. Allen GE, Brown SG, Buckley NA, O'Leary MA, Page CB, Currie BJ, et al. Clinical effects and antivenom dosing in brown snake (Pseudonaja spp.) envenoming--Australian snakebite project (ASP-14). PLoS One. 2012. 7(12):e53188. [Medline]. [Full Text]. Keith J, White J, Pascu O, Faian V, Keith J. Fatal cerebellar hemorrhage following Australian brown snake envenomation. Can J Neurol Sci. 2012 Jan. 39(1):120-1. [Medline]. Berling I, Brown SG, Miteff F, Levi C, Isbister GK. Intracranial haemorrhages associated with venom induced consumption coagulopathy in Australian snakebites (ASP-21). Toxicon. 2015 Aug. 102:8-13. [Medline]. de Silva HA, Ryan NM, de Silva HJ. Adverse reactions to snake antivenom, and their prevention and treatment. Br J Clin Pharmacol. 2016 Mar. 81 (3):446-52. [Medline]. CSL Antivenom Handbook. CSL Brown Snake Antivenom. Available at http://www.toxinology.com/generic_static_files/cslavh_antivenom_brown.html. Accessed: May 12, 2016. Maduwage KP, O'Leary MA, Silva A, Isbister GK. Detection of Snake Venom in Post-Antivenom Samples by Dissociation Treatment Followed by Enzyme Immunoassay. Toxins (Basel). 2016 Apr 28. 8 (5):[Medline]. O'Leary MA, Isbister GK, Schneider JJ, Brown SG, Currie BJ. Enzyme immunoassays in brown snake (Pseudonaja spp.) envenoming: detecting venom, antivenom and venom-antivenom complexes. Toxicon. 2006 Jul. 48(1):4-11. [Medline]. Yeung JM, Little M, Murray LM, Jelinek GA, Daly FF. 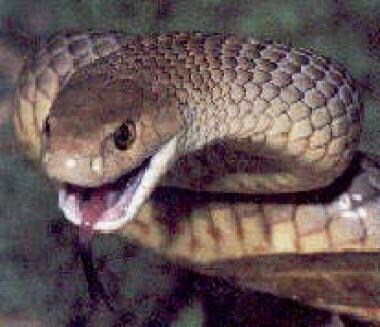 Antivenom dosing in 35 patients with severe brown snake (Pseudonaja) envenoming in Western Australia over 10 years. Med J Aust. 2004 Dec 6-20. 181(11-12):703-5. [Medline]. Brown SG, Caruso N, Borland ML, McCoubrie DL, Celenza A, Isbister GK. Clotting factor replacement and recovery from snake venom-induced consumptive coagulopathy. Intensive Care Med. 2009 Sep. 35(9):1532-8. [Medline]. Isbister GK, Brown SG, MacDonald E, White J, Currie BJ. Current use of Australian snake antivenoms and frequency of immediate-type hypersensitivity reactions and anaphylaxis. Med J Aust. 2008 Apr 21. 188(8):473-6. [Medline]. Morais V. Antivenom therapy: efficacy of premedication for the prevention of adverse reactions. J Venom Anim Toxins Incl Trop Dis. 2018. 24:7. [Medline]. The authors and editors of Medscape Reference gratefully acknowledge the contributions of previous author, Shaun J Chun, MD, to the development and writing of this article.